Apple's iPhone is the hottest mobile device on the planet. More than one million iPhone 3G phones were sold in the first three days of release and millions more are sure to be in the hands of iPhone fans each year. Apple's iPhone SDK has been updated and includes more than one thousand new APIs that developers will want to get their hands on. 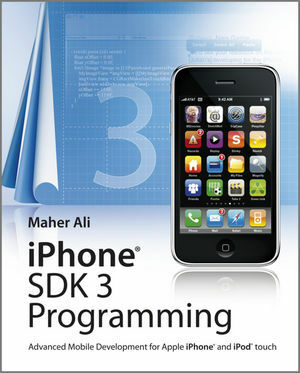 iPhone SDK 3 Programming shows you how to build great applications for the iPhone and iPod Touch. Inside, veteran mobile developer and Bell Labs scientist Maher Ali begins with a foundational introduction to Objective-C and Cocoa programming, and then guides you through building programs with Apple's iPhone SDK 3. With this advanced resource, you'll get the expert guidance you need to begin building native applications for Apple's new iPhone 3G as well as the iPod Touch. Maher Ali (Plano, TX) is a research scientist at Bell Labs. His research interests include optical networks, metro Ethernet, protocols, IPTV, and mobile communications/ applications. He is a senior member of the IEEE. 1.1 SDK and IDE Basics. 4 Anatomy of an iPhone Application. 4.2 Building the Hello World Application. 6.1 The Foundation of all Controls. 7.1 The Simplest View Controller. 9.2 The Simplest Table View Application. 9.3 A Table View with both Images and Text. 9.4 A Table View with Section Headers and Footers. 9.5 A Table View with the Ability to Delete Rows. 9.6 A Table View with the Ability to Insert Rows. 9.12 Whitening Text in Custom Cells. 10.3 Creating and Deleting a Directory. 10.5 Retrieving and Changing Attributes. 10.6 Working with Resources and Low-level File Access. 12.2 Document Object Model (DOM). 12.3 Simple API for XML (SAX). 12.4 An RSS Reader Application. 13.1 The Core Location Framework. 13.2 A Simple Location-aware Application. 13.4 A Tracking Application with Maps. 13.5 Working with ZIP Codes. 13.6 Working with the Map Kit API. 14.1 Working with the Accelerometer. 14.5 Taking and Selecting Pictures. 14.7 Accessing the Proximity Sensor. 15.4 Sorted List of Countries. 16.1 Text Field Alert View. 17.3 Computing MD5 Hash Value. 18 Working with the Address Book Database. 18.5 Person and Group Records. 18.8 Person Photo Retriever Application. 18.9 Using the ABUnknownPersonViewController Class. 18.10 Using the ABPeoplePickerNavigationController Class. 18.11 Using the ABPersonViewController Class. 18.12 Using the ABNewPersonViewController Class. 19.1 Core Data Application Components. 19.3 Using the Modeling Tool. 19.4 Create, Read, Update and Delete (CRUD). A Saving and Restoring App State. E.1 Adding a Unit Test Target. E.4 Writing Unit Tests for the Employee Class. E.5 Adding a Build Dependency. F Working with Interface Builder. F.1 National Debt Clock Application.